Come on in. This blog is my way of sharing with you all of the unique practices I have studied and mastered in my journey from a corporate lawyer to an Intuitive Business Facilitator, Spiritual Advisor, Wellness Coach and Holistic Therapist. I combine my knowledge of ancient wisdoms of Ayurveda, Yoga, and Energetics of the Mind Body and Soul with modern day life experience to offer practical tools and techniques for a happy healthy joy filled life. Contact me to arrange your personalised Gift Certificate today !! CONTACT ME TO BOOK TODAY !! 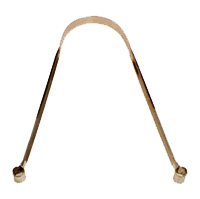 A tongue scraper is a small device which should be made of pure and unalloyed elements such as copper or silver, which impart considerable benefits to the human body. * avoid swallowing and reabsorbing these toxins to improve eliminating them for good! 2. After brushing, start at the back of your tongue, as far back as you can reach, without gagging and scrape towards the front of the tongue including the sides. 3. Keep the pressure fairly light ~ dont be overzealous! 4. Repeat 3 to 4 times until most or all the coating is removed. 5. Rinse mouth thoroughly with cold water. 6. Rinse scraper thoroughly before, during and after use in warm water. 7. Store scraper in a cool, dry, clean place. WHEN TO USE A TONGUE SCRAPER? 1. First thing in the morning after brushing teeth. 3. Before bed if desired. CAN I USE MY TOOTHBRUSH INSTEAD? Absolutely not! It does not have the design or texture or material required for a scraping of the tongue. Otherwise it would be called a "tongue brush" !! WHERE CAN I GET ONE OF THESE AMAZING THINGS?? Contact me and I can supply you with one. Whats My Dosha (Body Type) ? Hi there! I am ultimately no different from you. We are all the same where it really counts. In terms of what I have learned or rediscovered along my life journey, well I spent a good 15 years as a corporate lawyer before I realised I was unhappy with my life. I also suffered from 19 years of chronic food intolerances. After discovering Ayurveda the ancient "science of life" I cured what doctors and specialists could not. I now live a conscious life and assist others to do the same through various holistic modalities including Ayurvedic Holistic Health, Energetic Life Training Programs and personal sessions and Intuitive Business Coaching. Anjani Venusia was born of my passion for empowering people to initiate the necessary changes in life for inner harmony and outer health and wellbeing. I have done it, and anyone can do the same given the right encouragement, tools and support. If you are reading this and have an area in your life you would like to change then get in touch, book an appointment to see me, and lets work together to create transformational change in your life and the world at large! ~ Do you want to take back your power over your health & general wellbeing? ~ Are you stressed, lacking energy and in need of a physical overhaul from the ground upwards? ~ Do you need find more balance in your work and home life? ~ Are you looking for an empowering life change but don't know where to start? I guess we all want this to some degree or other. The trouble is finding the time and motivation to do this in an already busy daily life. This is where I can help. Think of me as your personal health & wellness life coach all rolled into one. Now imagine for a moment that you decided to run a marathon... or lets say a half marathon not to get too excited!. You wouldn't expect to be able to step out on your first day in your brand new trainers and run the entire length of the way would you. Well you can apply the same principle to adopting any new lifestyle routine. It takes the brain and the body a few goes to get it firmly embedded as a natural way of being. I offer Ayurvedic Health & Wellness Consultations from various locations in NSW. I have clinics in South Coogee and Camperdown Sydney. I also offer remote consultations via Skype. Initiate Ayurveda therapies have been designed to work in harmony with the body’s natural rhythms to heal, cleanse, relax and revitalize Initiate Ayurveda consultations use ancient wisdoms applied to Modern life for a complete holistic health and wellness overhaul Initial consultations involve a comprehensive health, diet & lifestyle assessment including pulse & tongue analysis. ~ Food For Your Doshas - what to eat for your body type and how to manage your weight without dieting!